This has been a wonderful year of growth at Rutgers Chabad! We have a full girl's dorm, almost full boy's dorm and record attendance at all our programs. We also have an amazing in-house, open to the public, cafe RU Brew at Chabad, and a one of a kind, delicious daily kosher meal program. 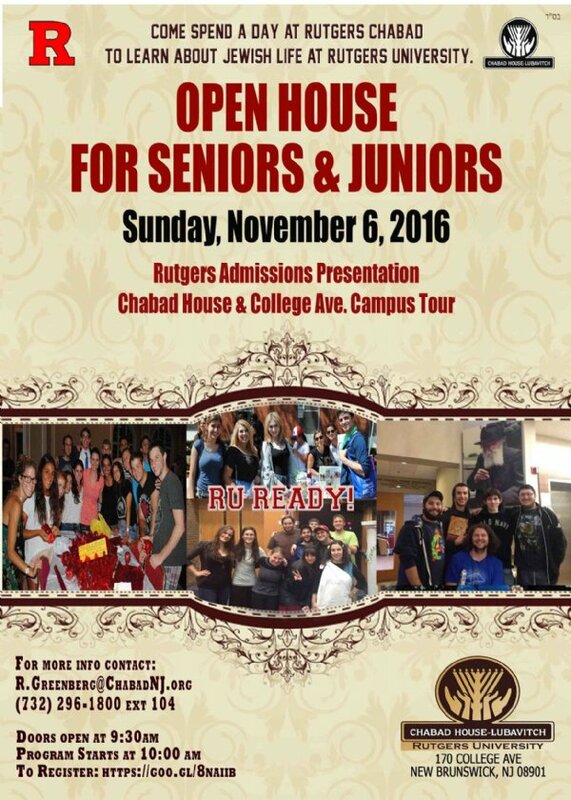 And now high school Juniors, Seniors, parents and guidance counselors will have an opportunity to spend a day at Rutgers Chabad at our FIRST Open House on Sunday, November 6th! We will be having a Rutgers University-New Brunswick Undergraduate Admissions representative give a presentation on the application process and a walking tour of the College Avenue campus. You will also get a tour of Chabad House's dorms, speak to current students and meet our rabbinical staff. This is a perfect and convenient opportunity to talk about academics AND Jewish life on campus!